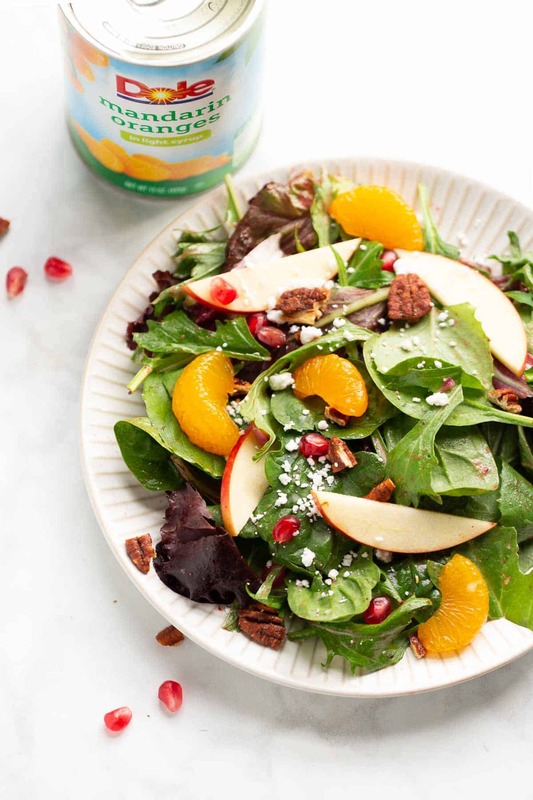 Holiday Apple Pecan Salad with Cranberry Vinaigrette! 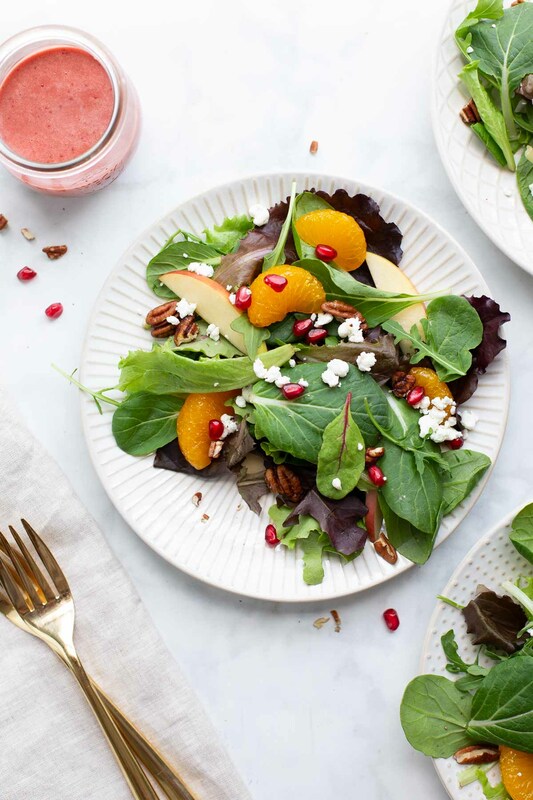 A gorgeous green salad full of mandarin orange, apples, goat cheese, pomegranate seeds, and sweet and spicy pecans all covered in a delicious cranberry dressing. Sometimes you need a gorgeous green salad to lighten up a holiday meal. Whether it’s Thanksgiving dinner or another holiday meal (try these Pork Tenderloin Medallions with Golden Applesauce! 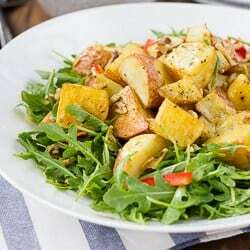 ), this salad is a beautiful addition for any gathering. 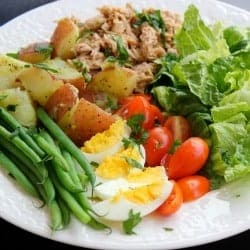 This salad recipe is based on one my Mom used to make for the holidays. It is full of mandarin oranges, apples, goat cheese, pomegranate seeds, and sweet and spicy pecans. 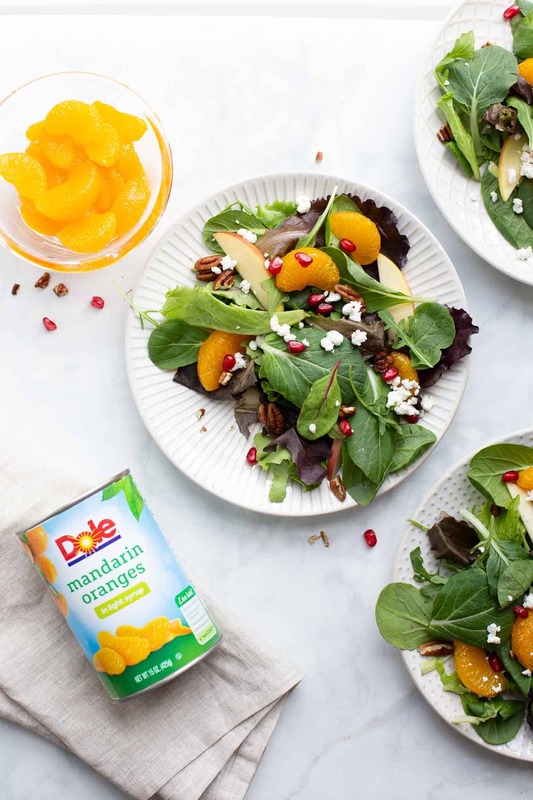 It’s all tossed in a festive cranberry vinaigrette so every bite is bursting with flavor! My Mom would make sweet and spicy pecans from scratch for her salads and I’ve included her tried-and-true recipe. However, if you want an easier option you can buy Sweet and Spicy Pecans at Trader Joe’s! A few months ago I made a salad with a delicious homemade blueberry dressing. The recipe for the dressing called for frozen blueberries. I was amazed at how great the frozen berries worked to give the dressing a great consistency, color and flavor. It turns out frozen cranberries work just as well in salad dressings! This dressing is really easy to whip up in the blender. 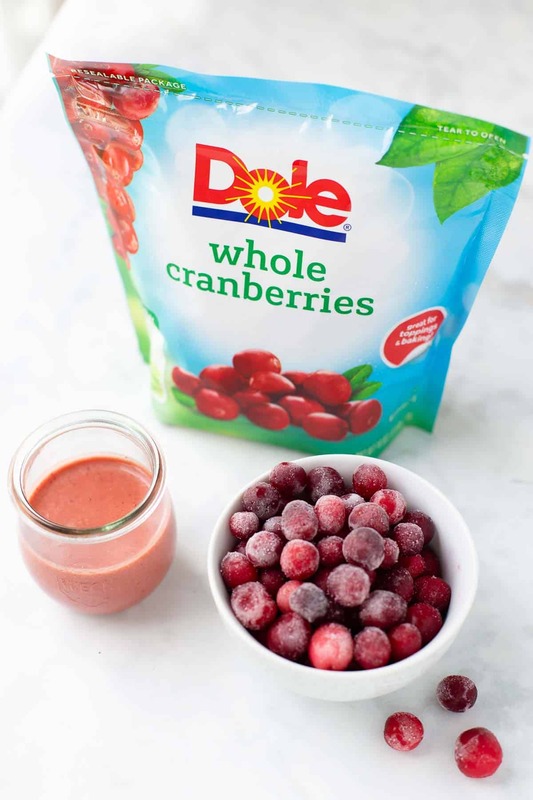 The Dole Frozen Cranberries give it a gorgeous light red color for a fun holiday twist! How to Make Salad for Thanksgiving I like to make this salad by tossing the greens together with the vinaigrette then portioning them out on plates. Then I like to top each plate with the rest of the ingredients. This helps the goat cheese and oranges to stay intact. It also ensures everyone gets all the yummy toppings in their portion! 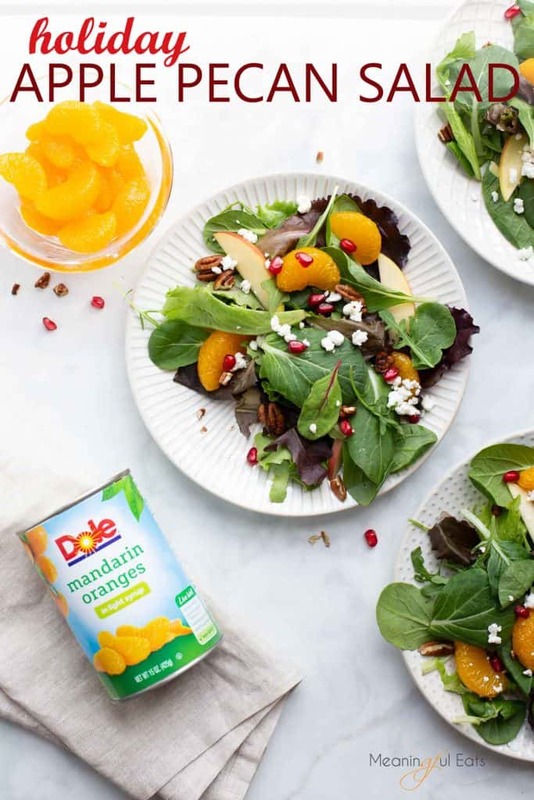 The Dole Mandarin Oranges are my kids favorite part of this salad! 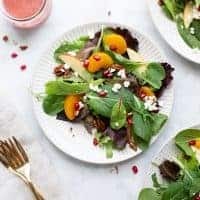 They look like gorgeous bright orange jewels and make this salad so pretty. If you’re in charge of salad for a holiday meal this season let this one be the one you bring! It’s a crowd-pleaser every time! 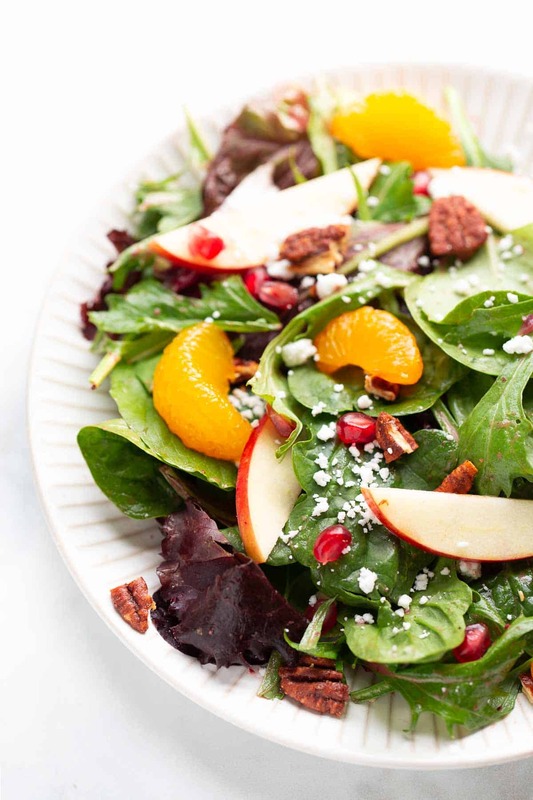 Holiday Apple Pecan Salad with Cranberry Vinaigrette! A gorgeous green salad thats perfect for the holidays! Make the dressing: Combine all the ingredients in a blender and blend until completely smooth. Pour into a jar (I like using a mason jar with these lids!) or airtight container. Make the sweet and spicy pecans: Preheat the oven to 350 degrees. 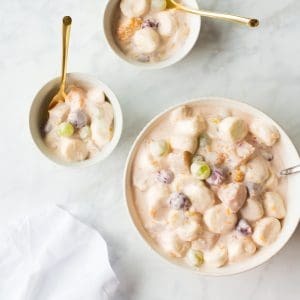 Dissolve the water and sugar in a bowl. Add the pecans and soak for 30 minutes. Drain and place on a baking sheet. Toss with the sugar, chili powder and cayenne pepper. Bake for 10 minutes, stirring once. Let cool then chop slightly if needed. Place the greens in a bowl and toss with some of the dressing. Add just a little at first then more if needed so it’s not overdressed. Place the greens on plates and top with some of the remaining toppings. Enjoy!